How Did Robin Williams Discover 'Multiple Jumanji Worlds'? The original Jumanji was pretty straightforward—a boy gets trapped in a jungle board game for 30 years, he and the other players finish the game, and he’s sent back in time once they’re done. 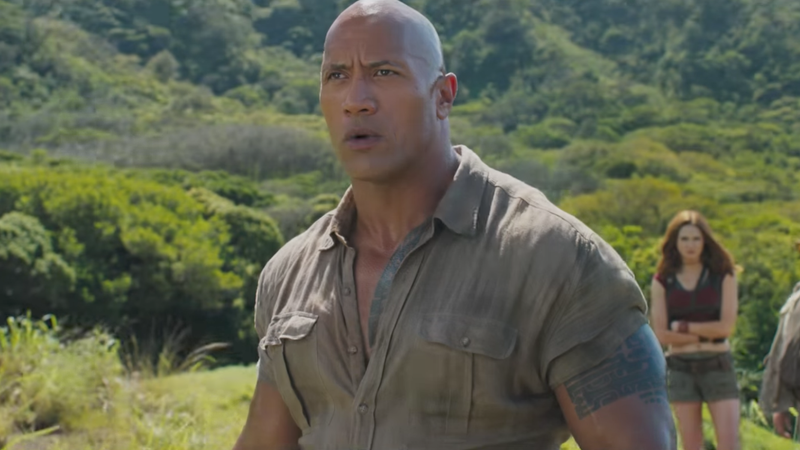 But apparently, there’s a whole lot more to this simple tale to be explored in Jumanji: Welcome To The Jungle, and we’re trying to wrap our heads around what the hell it means. During a set visit, star and producer Dwayne Johnson was asked by some reporters about how Robin Williams’ character, Alan Parrish, would be integrated into the film. In trying to avoid spoilers, Johnson gave a really cryptic answer. “Without giving too much away, for example, the journey that Alan Parrish went on [in the original film]... we sort of realize that he was the one that discovered that there are multiple Jumanji worlds,” he said. Okay, hold up. I was under the impression that Jumanji was a single place and that the board game was how people got there. And based on the trailers, I’d assumed the board game had either morphed into the video game, or the world of Jumanji had spawned another form of travel into it as a lure. But apparently, that’s not the case. And it’s pretty confusing. The way I see it, the whole multiple worlds angle could mean one of two things: either each Jumanji game is its own world separate from the others (all of which coincidentally share the same name), or this has to do with the multiple timelines established after Alan Parrish and Sarah Whittle went back in time (they were the only ones who remembered what happened). The first one seems really limiting, since there aren’t really that many distinct forms of gaming. And the latter just makes my head hurt. Maybe each Jumanji has its own jungle world and Parrish discovered one when he got trapped. There are several ways to interpret this comment and they’re all slightly off. I just don’t understand why it couldn’t be that the single world of Jumanji spawned another form of entry with its own rules. It doesn’t have to be another world. It’s freaking Jumanji, keep it simple! Besides, one of the biggest mysteries of the original film was what the hell Alan Parrish was up to during his 30 years in Jumanji. Having our new characters travel to the place where the franchise’s predecessor spent so much of his time would have been enough of an interesting connection. Adding another world Alan may not have been a part of takes away from that. Then again, it’s Jumanji and Kevin Hart is killed by a cake. I shouldn’t really care this much.